I am Chris Purdie (Documentary–2 minute excerpt) from Chris Purdie on Vimeo. 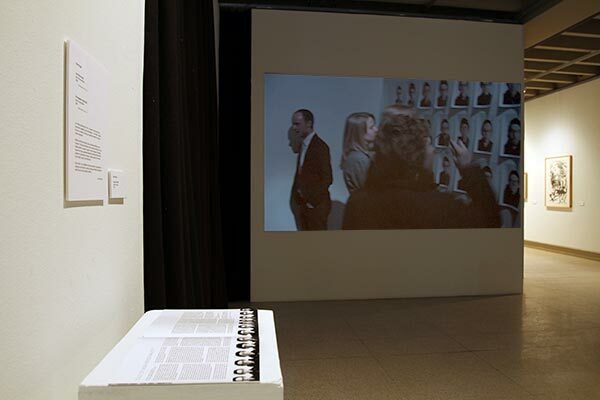 I am Chris Purdie (Documentary and Catalog) on display in The Ohio State University’s Annual Fergus Awards Exhibition. I am Chris Purdie is a performance piece with thirty-five performers playing the role of the artist Chris Purdie during the artists reception. The performers, dressed in the Chris Purdie uniform, engaged audience members and conversed with them the evening of March 6, 2009 at the Sego Art Center in Provo, Utah. The piece was inspired by too many uncomfortable and awkward moments at receptions and trying to escape or lessen those experiences. As the piece developed it became more about the importance of identity as created through internal and external interactions. The piece asked the audience to consider the importance of their interactions with their environment as well as other individuals in their communities. Neil Bly, Sherisa Bly, Joshua Dravland Brown, Fidalis Buehler, Duane Call, Joscef Castor, Ashley Mae Christensen, Brian Christensen, Maren Dennis, Emily Fox, Christopher Groesbeck, Monson Hayes, Carl Hoiland, Kaneischa Johnson, Eddie King, Andrew Kosorok, Kat Mandeville, Denise Metcalf, Melissa Myers, Hailey Nebeker, Aaron Ogilvie, Gian Pierotti, Amy Purdie, Chris Purdie, Dennis R. Purdie, Jason Purdie, Jayson Reynolds, Laura A. Rowley, Judy Simmons, Lisa Stoffer, Jake Ben Suazo, Jayci Taylor, Amanda VanValkenburg, Cecilia White, Hallie Wiseley. Understudies: Austin Neal Lynn Baker, Ashlan Schofield, Amalia Smith. Director: Judy Simmons; Art Director/Producer: Chris Purdie; Executive Producer: Ben Unguren; Editors: Tracy Derenthal, Judy Simmons; Associate Producer: Cameron Wilbur; Sound Editor: Neil Bly; Cameras: Spencer Cahoon, Aaron Ogilvie, Travis Pitcher, Andrew Smith, Jarime Billings; Narration Editors: Chad Murphy, Lee Kimball; Narrators: Andrew Kosorok, Emily Fox, Monson Hayes, Judy Simmons, and Chris Purdie. A sixteen page catalog also accompanies this piece. Design: Cole Nielsen; Essays: Jill Dawsey, Wade Hollingshaus; Introduction: Jason Metcalf; Editor: Lynda Palma; Photography Editor: Chad Keyes; Funding: The Laycock Center; Printer: Brigham Young University Print Services; Photography: Leo Patrone (front & back cover, 4–5), Chad Keyes (3), Justin Hackworth (2, 10), James Lyons (6–7, 9, 11), Duane Call (12); Printed in Edition of 200.